King County Sheriff released security video of sheriff’s deputy who slammed a man into a wall at Cinerama on May 10, 2009. A man who suffered a catastrophic brain injury from which he never recovered after being slammed into a concrete wall by a King County sheriff’s deputy six years ago died on Thursday night. A man who suffered a catastrophic brain injury after being slammed into a concrete wall by a King County sheriff’s deputy six years ago has died. Christopher Sean Harris was permanently disabled after he was mistakenly identified as a suspect, chased and then pushed into a wall outside Seattle’s Cinerama theater by Deputy Matthew Paul. King County and the sheriff’s office settled a lawsuit filed by Harris’ wife, Sarah Harris, for $10 million in 2011 after she claimed Paul had been negligent and used excessive force. 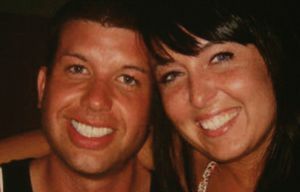 Harris, 36, formerly of Edmonds, died Thursday, according to his wife’s attorney, Sim Osborn. Urquhart was a spokesman for the Sheriff’s Office in 2009. Sarah Harris and her husband moved into their own house in Olympia shortly after their case was settled, and she was his primary caregiver for the past six years. The settlement — which was then the largest individual award ever paid by the county — came as a civil trial over the lawsuit was under way in Pierce County Superior Court, just before deputy Paul was scheduled to testify. Paul, who never has spoken publicly about the incident, remains on the force. His continued employment was a source of deep distress for many of Harris’ relatives and supporters. “I don’t know how they can pay that amount and say something isn’t wrong,” Sarah Harris said during the civil trial. According to court documents, Harris paid someone $60 to drive him to Seattle after he finished work at an Edmonds restaurant on May 10, 2009. 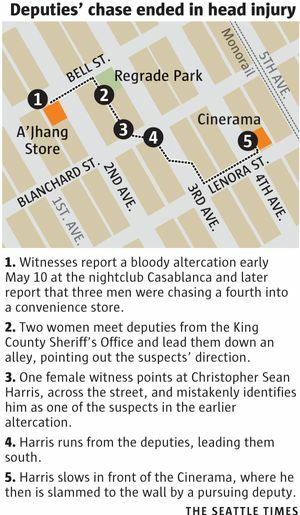 While walking through Belltown, he was wrongly identified by a witness as a suspect in a bloody bar fight that re-erupted inside a nearby convenience store. The witness pointed Harris out to Paul and another deputy, who were both working as King County Metro Transit officers. Harris led the deputies on a roughly 2 ½-block foot chase as the deputies yelled for him to stop. The two sides disputed exactly when the deputies identified themselves as law enforcement officers. According to testimony during the civil trial, Paul and fellow Deputy Joseph Eshom were wearing black tactical uniforms, not traditional deputy uniforms. Attorneys for Sarah Harris argued that Chris Harris likely didn’t realize Paul and Eshom were officers. As Harris slowed to a stop, Paul delivered a hit to Harris’ chest, slamming him into the concrete wall outside the Cinerama theater at Fourth Avenue and Lenora Street. A surveillance camera outside the theater captured footage of the incident; Harris is seen raising his hands before he is hit by Paul. An internal Sheriff’s Office investigation determined that Paul delivered a “hard shove” that fell within legal bounds. The King County Prosecuting Attorney’s Office, calling the confrontation “a very tragic incident,” declined to file criminal charges against the deputy. But Sarah Harris’ attorneys, Osborn and Ray Dearie, filed suit, claiming Paul used excessive force and the Sheriff’s Office tried to cover it up. Harris, a newlywed at the time, was left paralyzed and unable to speak. Although the county settled the lawsuit, jurors interviewed afterward said they would have found in the Harrises’ favor. Another juror, retired truck driver Carl Fredback, said at the time that he was pretty much decided in Sarah Harris’ favor. “It was excessive force. I don’t care what [Christopher Harris] did, he didn’t deserve to be creamed into the wall like that,” said Fredback, of Gig Harbor. Christine Clarridge: cclarridge@seattletimes.com or 206-464-8983. Seattle Times news researcher Miyoko Wolf contributed to this story, which includes information from Times archives.